Maggie is a 4-year-old dog who came to NorthStar VETS with vomiting and bloody diarrhea. She developed shock from severe fluid losses, and a clotting problem from internal bleeding. It’s possible that she ate something she shouldn’t have eaten. This can be a common progression in some dogs with sensitive gastrointestinal (GI) tracts and dietary changes or indiscretion. What is unique is the complication that developed during her treatment. Maggie was hospitalized and received fluids, acid reducers, multiple nausea medications, antibiotics, and had plasma transfusions to support her lost blood. She was under close supervision of the Emergency and Critical Care specialists, Dr. Barbara Maton and Dr. Steven Berkowitz. Her initial ultrasound with Dr. Kate Kerrigan of the Radiology team showed severe intestinal irritation. After a few days in the hospital, her GI signs lingered, and on New Year’s Eve she developed more severe internal bleeding and shock, needing both red blood cell and plasma transfusions. Her ultrasound was rechecked with Dr. Jackie Williams of the Radiology team, and an exploratory surgery was recommended due to the intestinal problems. 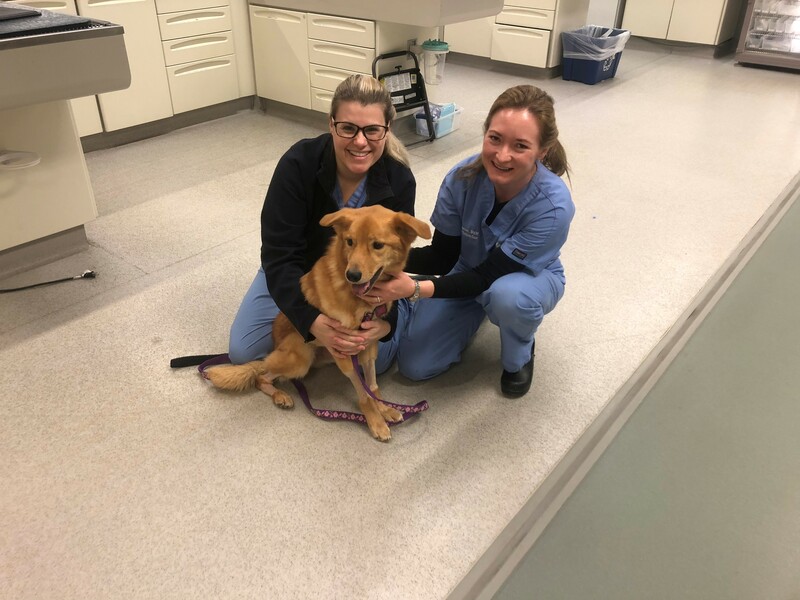 Maggie posing with Dr. Kelly Kraus (left) of the Surgery team and Dr. Barbara Maton (right) of the Emergency and Critical Care team. Fortunately, Surgeons are on call 24/7, and on New Year’s Eve, Dr. Kelly Kraus of the NorthStar VETS Surgery team performed an abdominal exploratory surgery. We were concerned her GI tract was in big trouble, but what was found was shocking! She had developed a mesenteric torsion (twisted intestine), and the majority of her intestine was black and dead. A small, moveable object was identified in the intestine and removed along with the dead intestine. Maggie needed a lot of intensive support and monitoring during her surgery, and post-operatively to keep her stable. She also received additional blood transfusions (plasma and red blood cells) due to severe GI tract bleeding and bleeding from torn blood vessels involved in the twist. Thanks to the Blood Donor program at NorthStar VETS, the team was able to give her the blood product support that she needed. Maggie rolled out of the operating room to the Intensive Care Unit around 10pm New Year’s Eve, in time for the ball drop! A mesenteric torsion can be triggered by anything that triggers gastrointestinal irritation; including changes in food/diet/dietary indiscretion, infections, and parasites. Unfortunately, because it is so severe, rapidly progressive, and involves a lot of tissue death and shock, the prognosis is grave and the mortality rate is high. Mortality rates have been reported as 50-100% in German Shepherds, but are variable and lower in other dog breeds, if diagnosed and treated rapidly. There are some publications of animals surviving with rapid aggressive interventions, surgery, and intensive care. Maggie is one of those miracles! 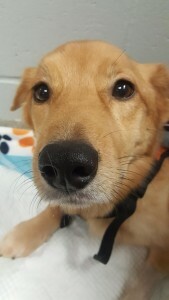 Maggie was treated intensively post-operatively with the Emergency and Critical Care specialists, and received nutritional support through a feeding tube to support her GI healing. She was able to be sent home with medications, and thus far is doing well! Unfortunately, due to the amount of intestine that had to be removed, Maggie is at risk of short bowel syndrome. This can lead to chronic diarrhea, mal-absorption/mal-nutrition, small intestinal bacterial overgrowth, and other complications. She will need close bloodwork monitoring as well as a low-fat prescription diet, B vitamin supplementation, and other medications to help her heal. Fortunately, the GI tract is very adaptable, and has the potential to improve over the course of weeks to months. The team at NorthStar VETS is hoping for a great outcome as Maggie is a strong girl, and is already on the road to recovery! 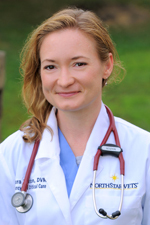 This entry was posted in Pets, Veterinary Medicine and tagged Barbara Maton DVM, Critical Care, Jackie Williams DVM, Katherine Kerrigan DVM, Kelly Kraus VMD, NorthStar VETS, torsion, Veterinary Emergency. Bookmark the permalink. god bless you vets and the kind techs that work along side them, i have a puppy dalmation who is a patient of dr krause who is kind, brilliant, and beautiful inside and out. just knowing you are all there and on call round the clock is comforting to know. i watch luke like a hawk but you just never know. i hope and pray little maggie just heals completely and has many happy healthy years to come!